This twitterpated print is the perfect tribute to a couple who is wild about each other. This twitterpated print by Jacqueline Schmidt is the perfect tribute to a couple who's wild about each other. 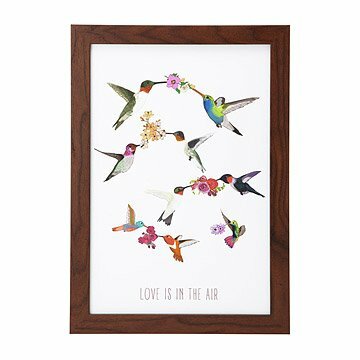 Flocks of vibrant birdies flit gleefully across the print, reminding us that love is always around us should we choose to look for it. Designed in Brooklyn, New York. Printed and framed in Portland, Oregon. Arrives framed and ready to hang in walnut eco-friendly Bonanzawood frame, or arrives unframed and rolled in tube.